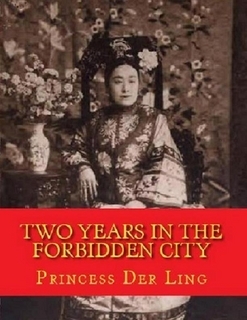 In my quest to find more books in the public domain written by people of color, I found these memoirs by Princess (this title is controversial) Der Ling about her stint as a lady-in-waiting to the Empress Cixi at the turn of the 20th century. Two Years in the Forbidden City is actually about one year in the Forbidden City, and the last chapter basically says "the second year was much the same as the first so I won't get into it." Der Ling spent most of her life abroad. Her parents were very progressive and she received an education in Europe. Thus, when she came back to Europe, she was one of very few people who could serve as an interpreter in the imperial household. The empress took a liking to her and Der Ling became a chief lady-in-waiting, spending most of her time with the imperial household. Her memoirs present an intimate portrait of a complex woman who seized power for herself, refused to hand it over to her son the emperor, and ruled a massive country for nearly 50 years. Most people believe she was a despot - she certainly was anti-reform and, like most royals, very against ceding power to the masses. This book was interesting because the subject matter was interesting, not because Der Ling was a gifted author. There are details about the customs, costumes, traditions, and schedules that dominate life in the imperial palace and just how large a part of that life eunuchs were. There are conversations that make clear the empress' lack of knowledge about anything that goes on outside her borders, her distrust of foreigners, her refusal to cede any power, and her ability to play people off each other. But really what came through to me (and what often comes through to me when reading books about royal families) is just how much people did to ensure that the empress was happy. It often felt more like baby-sitting or brown-nosing than anything else. Whether she was right or wrong, factually, the empress was always right in her royal bubble. People would bend over backwards to do whatever she wanted, even if the request was unjustified. For example, Der Ling's father was very ill once and Der Ling's family wanted to go and visit him, but the empress did not want them to leave, and so they had to stay until she changed her mind. This was mind-boggling to me. The possibility of not seeing your father when he's already very old and ill just because someone wants to keep you around as a pet is pretty horrifying. And the impact all of these yes-men had on the empress is pretty obvious - she is mercurial, selfish, and completely incapable of thinking she can do any wrong. Anything that goes wrong is someone else's fault (including, as I say below, the Boxer Rebellion), to the extent that the Empress declares herself to Der Ling to be the smartest woman in the world, even though history generally doesn't agree. I am skeptical of the view Der Ling presents to us of the Empress herself. Towards the end of the story, she tells us about a very long, very one-sided conversation the Empress had with her, justifying her actions during the Boxer Rebellion. It's hard for me to believe that the Empress Cixi would just sit down with a lady-in-waiting, favored or not, and give her such a long explanation of her actions at that time. The empress dominates this book. No one else is given any personality, and hardly anyone else is really even mentioned by name. It's always "the eunuchs" or "the other court ladies." The Emperor has a small role but we don't get to know him well, either. Der Ling's prose is neither particularly expressive or memorable. She outlines what happens but doesn't give us that much detail. She describes clothing and some food, but not in any way that makes you feel the silk against your fingers or the dumplings on your tongue. I don't think she was a very gifted writer. But she does provide us with insight into a lifestyle that's disappeared, and her book is valuable for that alone. Glad you are expanding your reading of women of color. I find them some of the best around. Good sources for both titles and books are the feminist presses which specialize in them. Feminist Press and Aunt Lute in the US; Innana Publishing in Canada; and Spinifex in Australia who send ebboks to avoid shipping costs. Have fun. I have been reading lots of these if you ever have a question. If you have authors and titles they are easier to find in libraries even if they are not public domain. So glad I have mastered how to comment through Wordpress. I really like your choices of books and your reviews. Have you ever read Anchee Min's novels? She does a fictionalized version of Empress Cixi's life in Empress Orchid and The Last Empress. This book does sound quite interesting, and does confirm impressions I have had about Empress Cixi from other books I have read. She was a very important figure in Chinese history but not in a good way. Well, I suppose one doesn't ALWAYS have to taste the dumplings, maybe it's unreasonable to expect that kind of detail, but I do prefer writing that more vehemently involves the reader's senses. Still, I enjoyed reading your thoughts on this one, and I think it's interesting it's available in the public domain. This is a great find! I think in general it's rare for a book to give a first-hand account of the Imperial Court, especially the women's area. That's an interesting way to describe the second year, lol.